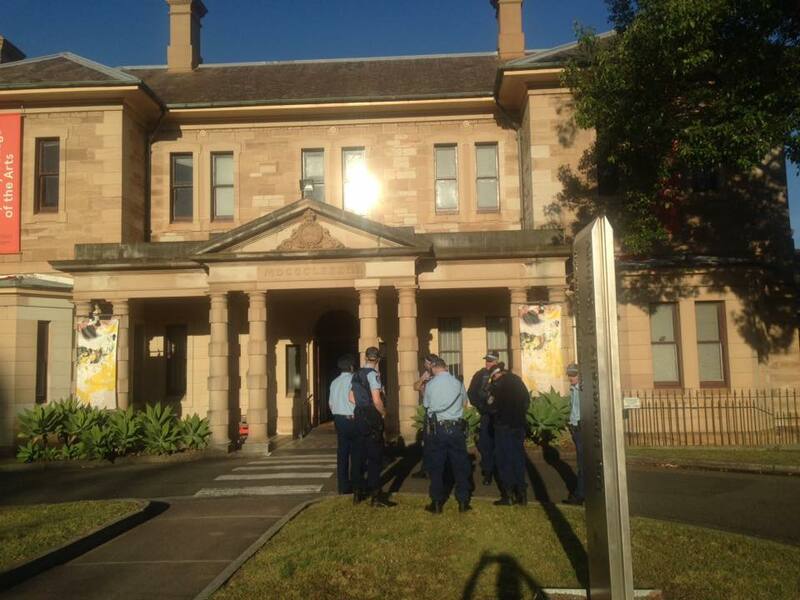 College of Arts on Tuesday morning to break up a three­month student occupation. There were two occupiers in the office at 6.30am when police cut the front door in half and stormed up the stairs. One of the protesters, Che Baines, said he was woken by the noise and appearance of several burly men. Mr Baines, 20, is not a SCA student but said he had joined the protest to support student friends scrambling to complete final assessments, after experiencing a similar situation at his art school in Quebec. Mr Baines said the security break­in came without warning and “was very intimidating, they gave us 30 seconds to leave and told us not to question them”. A fellow protester, MA student Rachel Evans, 41, was physically removed by five men, he said. The University of Sydney’s provost Stephen Garton had previously expressed tolerance for the students’ right to protest. Mr Baines said, “the university had been very careful to show that side, but that’s obviously changed”. The university declined to comment on the intervention but released a statement. “A number of students and their off­campus supporters have occupied the Kirkbride building at the university’s Rozelle campus … unfortunately a number of them have shown little respect for people or the laws governing safety for themselves or others, despite numerous formal requests,” the statement says. “In addition, protesters refused a number of polite, informal and then formal requests for the university to relocate personal possessions,” it read. The statement from a spokeswoman was not attributed to anybody at Sydney University but it claims unnamed SCA students and staff had expressed distress at the occupation. It says they complained the occupation had adversely affected their studies and working environment. “As a result, the university has reluctantly taken action to remove the protesters from the building.” Sydney University further warned protesters that the action could escalate. “The university has the right to exclude anyone who has been party to the occupation from its campuses. It has chosen not to do so at this stage, but students and their representative groups have been warned that any further attempt to occupy could see the university exercise this right,” the statement says. The students were protesting against the university’s decision to suspend student intake for a year in 2017 and move the school from 2018 to the main Camperdown campus, away from the Callan Park site in Rozelle, where it has been for 25 years. They contend the move, which will result in staff losses, will hurt the school’s potential and stymie their ability to practise art in suitable studio spaces. The occupation commenced on August 22; three weeks later, college dean Colin Rhodes prematurely retired.